This project was a section of the wider Reconstruction of the Esk – Hampton Road. More than 200km of state-controlled roads in the Darling Downs were damaged by the flood events of 2010-2011. 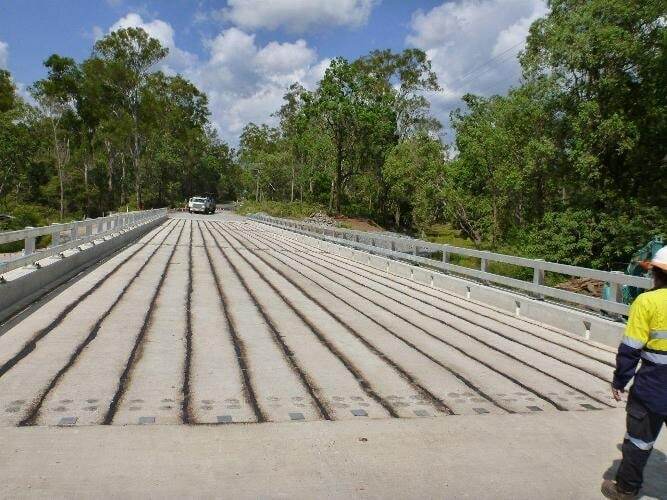 $435 million was committed to the reconstruction of state-controlled roads in the Darling Downs Region. The work is part of Operation Queenslander, the largest reconstruction effort in Queensland’s history, rebuilding communities, fixing infrastructure and restoring regional economies. The project was delivered under the Natural Disaster Relief and Recovery Arrangements (NDRRA), a joint federal and state initiative. Due to the loss of the original bridge, a temporary causeway was established by the Transport Network Reconstruction Program (TNRP). The temporary causeway built beside the washed-out bridge comprised low-flow pipes underneath a meter of concrete through the creek bed. 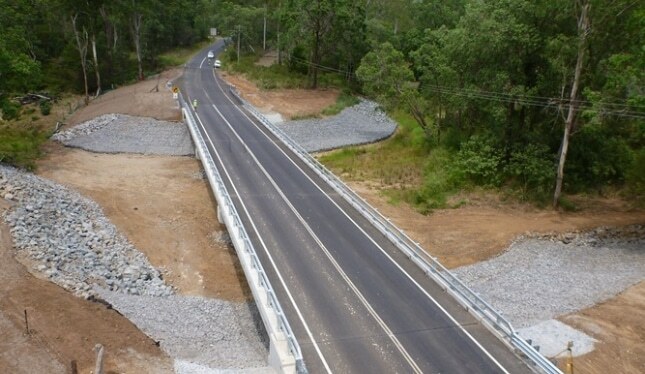 Abergeldie Complex Infrastructure™ was awarded the project to rebuild and resurface the approach road, remove the temporary causeway instated by TNRP, construct a dual lane, three span, concrete bridge, 60 meters in length complete with abutments and approach slabs; and stabilise creek banks and the creek bed to prevent erosion.